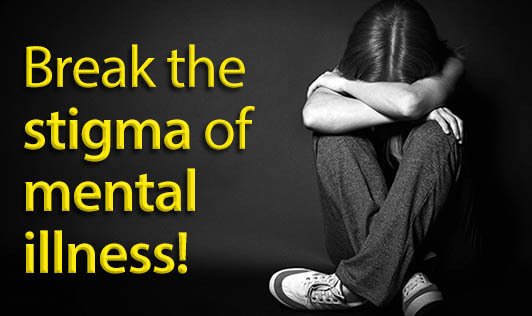 Break the stigma of mental illness! Looking healthy and being healthy are two very different things. A man may have the perfect job; have a lot of friends, a loving family. But one fine day the people who thought that the individual who has a perfect life hear that he has committed suicide. Mental illness is no one’s fault, if we are able to be open about it and seek help and support, suicide and other such unnecessary pain can be prevented. People need to understand that consulting a psychologist or a psychiatrist does not mean that they are mentally weak. Negative attitudes towards people with mental illnesses continue to fuel! Due to such reactions, a large number of individuals don’t seek help. They are scared and worried of being discriminated if they come clean about their mental illness. Such incidents can happen to you or your loved one as well. So “THINK” before you isolate someone because he or she is suffering from a mental illness! Support people suffering from mental issues and treat them with respect. Above all encourage them to seek treatment. Myth: Mental illness is rare and doesn’t affect average people. Fact: According to the American Psychiatric Association, mental illness can strike people of any age, religion, and race or income status. Myth: People with mental illness are dangerous. Fact: This powerful myth has been fed by the media and vast majority of people who suffer from mental illness are not dangerous. They are likely to be victims of violence and crime than the perpetrators. Myth: If you have a mental illness, you can will it away. Being treated for a psychiatric disorder means an individual has in some way “failed” or is weak. Fact: Mental illnesses are as real as other diseases like cancer or diabetes. Some mental illnesses are inherited, just as some physical illnesses are. They are not the result of a weak will or a character flaw.